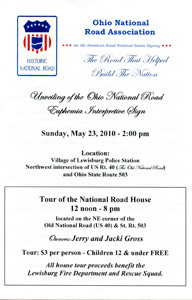 The third Ohio National Road Interpretive sign was unveiled on May 28, 2010. 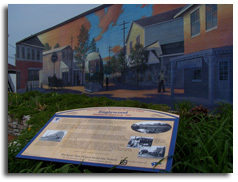 This sign is located in a small park at the NW corner of Main Street (SR 48) and the National Road in Englewood. 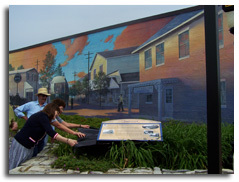 The sign is installed in a flower bed beneath a magnificent mural painted by Keith Hasenbalg. 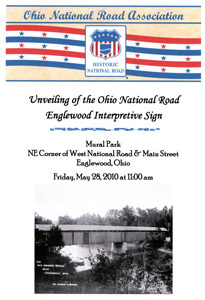 This photo depicts the moment of unveiling for the Englewood Interpretive sign. 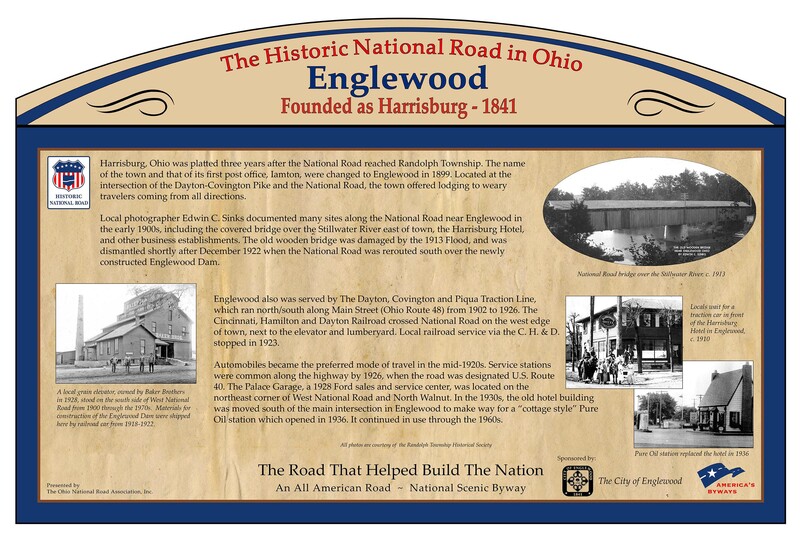 Those assisting Ohio National Road Association President Cyndie Gerken were Glynn Marsh of the Randolph Township Historical Society and Englewood Mayor Pat Burnside. 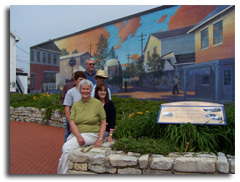 Pictured beside the interpretive sign are Sue Cummings and Glynn Marsh of the Randolph Township Historical Society. 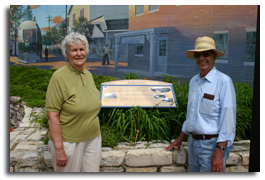 Sue and Glynn not only designed the Englewood sign, but also wrote the text and provided the historic photos from the Society’s collection. Englewood City Manager Eric Smith (shown at back in this photo) was on hand for the unveiling and is shown with Glynn Marsh, Mayor Pat Burnside, ONRA President Cyndie Gerken and Sue Cummings.” Also in attendance (not pictured) were Eric’s Administrative Assistant Teri Davis, Englewood Vice Mayor Tom Franz, Councilman Mike Kline, and ONRA Board members Paul Seibel and Mark Davis. 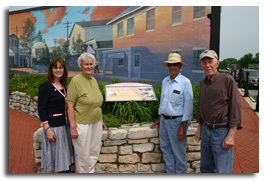 Shown with the Englewood Interpretive sign are (left to right): ONRA President Cyndie Gerken, RTHS’s Sue Cummings, Glynn Marsh, and former Englewood Mayor Ed Kemper. 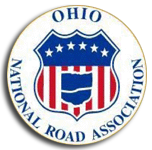 Ed is a past President of ONRA and currently serves on the Ohio National Road Association Board as its Secretary and a Montgomery County representative.